Traveling for 20 hours or more by air! Most of you know by now that I recently flew to India to spend some time with family. It’s always great to meet up with relatives and friends and even greater to shop and to gorge on some mouth-watering food which we miss so much here. But the thing that I really hate about going back home is the long air travel. By virtue of my location, it becomes even harder as I only have one airline option to fly directly to Bangalore, India. But being from the travel industry, I am not too keen to fly that airline as they are notorious for poor baggage handling and lately their crew goes on strike often. Once during our previous trip, our baggage didn’t come and the airline staff was right outside our gate waiting for us. Before we could react, they handed us cash for necessities and told us that the bags would come in the next flight. Cash is good, really good. It makes you even smile at them. Then the form makes its appearance where we have to list all the valuables and the net worth in each baggage. It hits you then, “what if I don’t get the bags…oh, my favorite pair of jeans, my expensive sweater and all the gifts I got for family. I know the money they give will cover everything but do they really understand how much time and effort I have spent shopping for those best-fit jeans? So, my only other option was to fly out from major airports like Denver, Chicago, LA etc depending on the airline. I took my friend’s suggestion and tried Singapore Airlines, loved it and have been flying with them since 2006. So, my first leg of travel was to fly to LA and it takes about an hour and a half. There was a short layover of 3 hours in LA. But by the time you go to the international airport, stand in line to get your boarding pass and go through security, trust me, you will have no time to kill. Because, LAX airport is worse than an airport even in a developing country! Okay, the next leg in my journey was from LA to Tokyo which is about 12 hours. Since it took off at noon, you really can’t fall asleep. That’s why I am glad to be on Singapore Airlines as they have the best in-flight entertainment. They not only have the latest movies but also some episodes of popular TV shows, non-stop music, games etc. At this point, they served us lunch. Their vegetarian Indian meal is pretty average. I really don’t know why they gave me a bag of Sun Maid raisins at every meal. It’s not like we Indians keep snacking on raisins or maybe they want us to. Go Figure! I still wasn’t sleepy so I went back to browsing for more movies and decided to watch “My Sister’s Keeper”. It had some great performances and tear-jerking moments! I recommend watching such movies to keep your eyes from getting dry in that frigid air. Then came dinner with another bag of raisins! LOL! By then it was 11 pm (LA time) and I finally fell asleep but an hour later the flight landed in Tokyo. Aarghh! Here, we get an hour’s break before we embark the same plane to sit for 7 more hours to reach Singapore. At this point you are pretty much dead beat and despite all entertainment, all you want to do is sleep. 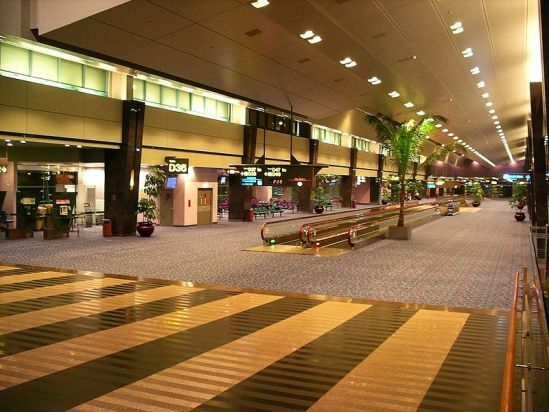 We finally reached the magical Singapore Changi Airport, a Mecca for the tired traveler. 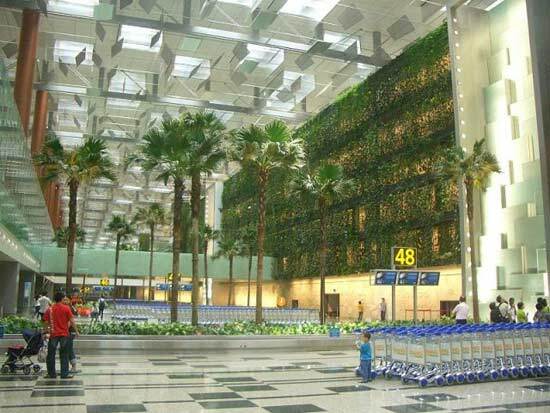 I fly Singapore Airlines mainly because of my love for this airport. It is not a mere airport people, but it is a mini-city. It has everything that you can possibly imagine from a full-fledged state-of-the art gym to transit lounges. It also has a hotel called Ambassador Transit hotel where you can rent rooms on a 4-hr basis. Apart from numerous restaurants serving different kinds of cuisines, there is also a fantastic range of shopping from travel necessities to apparel, make-up, perfumes, electronics, souvenirs etc with brands ranging from Burberrys, Tiffany’s, Gucci and so on. There is free internet browsing stations, Wi-Fi areas, a movie theatre, children’s play area, an orchid garden and now more recently a butterfly garden. They even have a huge swimming pool. Phew! You can live here for 2 days and not get bored, really! My last leg was a mere 4 hours flight and I was in Bangalore. Touch down! Of course, you now deal with jet lag until your disoriented body gets used to the time zone. Best part for me is I travel either ways and I still come home! You are currently browsing the Kaffeinerush's Blog blog archives for December, 2009.